Extracting target schemas and mappings. Processing extracts through Utopia AutoDesigner to generate standardized RDM methodology templates. Applies all naming standards and conventions. Formatting look and feel of dataflow objects to SAP standards. 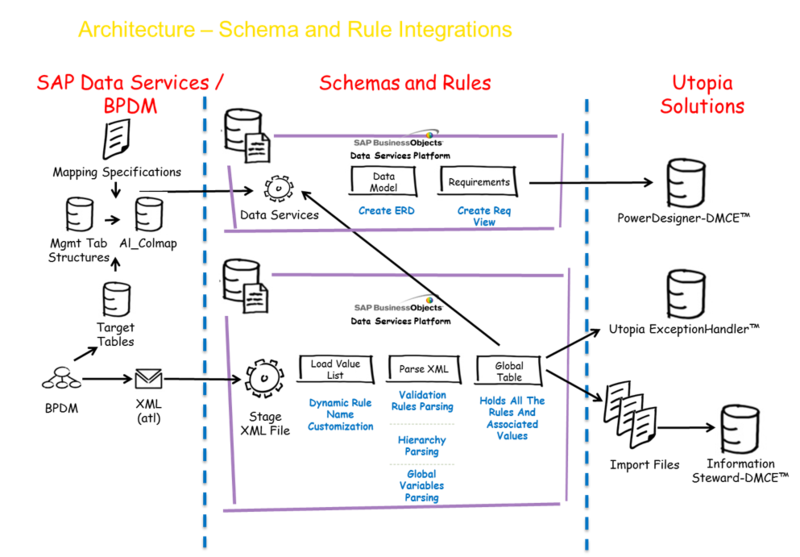 Layering Mandatory, Format, and Lookup rules inside of SAP Data Services. Utopia best practices overview for creating RDM templates. Leverages Data Services to actually create other Data Service jobs. Will source general mapping specifications and generate an SAP Data Services. atl (contains associated Job, Workflows, and Dataflows). Import.atl back into Data Services and modify accordingly. Better data migration accelerators within the Rapid Data Migration (RDM) and Data Migration Content Extensions areas, are specifically engineered for each project, to speed time to migrate, reduce effort and improve quality. Ask us about our end-to-end “build-fix-sustain” 10-point solution for your next data migration, merger / acquisition / divestiture, consolidation or other data quality / data transformation project.